The Ambassador City Center Hotel has been our temporary home since arriving in Europe. It has a wonderful ancient Egyptian theme in much of it's décor. There are a couple of statues inside the front door, and the hotel restaurant is just full of wonderful pictures of discoveries of ancient Egyptian sites. The image below is just one of about a dozen where we had a great breakfast each of our mornings here. According to our guide Jesse, our bus, shown below, will become our new "sanctuary". We'll spend plenty of time on it over the remaining time here. It's a very nice bus, quiet and comfortable, but we don't have any power ports or internet. Our driver is from Belgium and his name is "Derek". At least, that is how his name is said. It is spelled Dirk, but he does not like it when it is pronounced the way it looks. He says that it does not rhyme with jerk!! We had a two hour ride when we left Haarlem traveling to our next destination. We visited the Holland Open Air Museum in Arnham for the first half of our Tuesday. This is a place to which old buildings have been moved that have been passed by time and progress. It is essentially a place that documents how the Dutch have lived down through the ages. There are very old barns, homes, businesses, and other buildings from Holland culture preserved here. There are a good number of windmills also. The paper making and laundry were especially interesting. At the Open Air Museum were some wonderful gardens, including these beautiful examples of topiary. We were due to have a lunch of Dutch pancakes at a certain time, and ten minutes before, we found a maze made of hedges. Janice was not amused to be going this way and that with the very real prospect of being late to lunch! I don't think the fear was that we wouldn't have any food left (as we have been eating very well since arriving in Europe), but that we wouldn't be able to find our way out and we would not be present to be part of our "buddy-count" (maybe I'll explain that later). As it turned out, we found our way out of the maze right across from the front door where we were to eat our pancakes, and with a few minutes to spare! The photo below shows what I think was the largest of the windmills at this site. They are all so interesting. A small herd of large black cows were in the field in front of the large windmill below. The fence did not seem high enough to contain them, but we only saw them in the field, not out with all the people. We watched a man unfurling the fabric on the arms of one windmill, getting it prepared for operation. As we were walking back to meet our group, getting ready to leave, we saw this pond on our right. Janice said, "I want to get a picture of that!" And she did! What a beautiful view and now we have it with us, not just in our mind, but permanently! 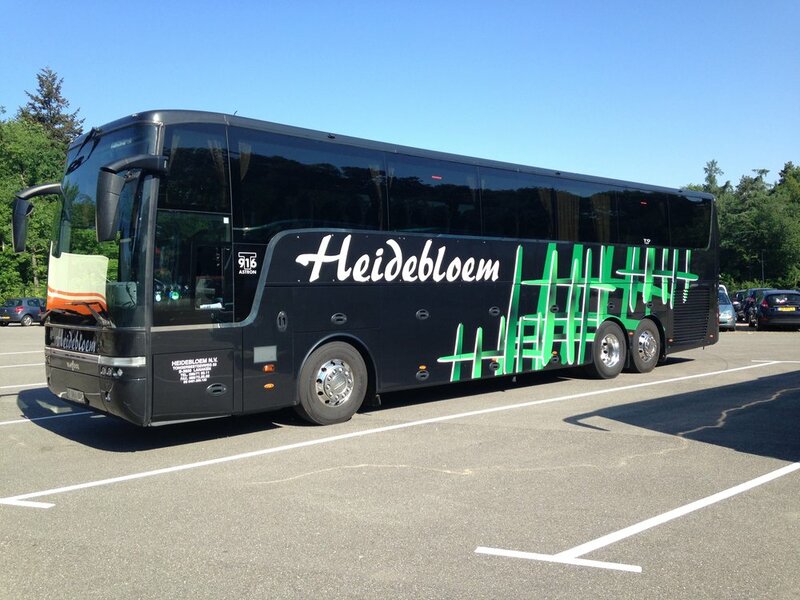 Dirk, our driver, had a nice surprise which he shared with all of us on the bus. Belgian chocolates! They were, as one would expect, very good. Jesse had a few different types of taffy for us to try including a salty type. At least he was not able to find the super-salty! After another few hours, we arrived in Bacharach where we will spend the next two nights. This is a beautiful town on the Rhine River. We are staying in a part of an 800 year old tower which was one of 16 back in the earlier years of the town. We had to take our luggage up only three flights of stairs like the ones in the photo below. The rooms are certainly old, but quite nice. The internet here is very spotty in the rooms, and even in the hallway where there is a repeater, it is only marginally better. The best signal I have found is in the dining room downstairs. The photo below shows the side of the hotel facing the hillside on top of which is a castle. On the other side of the hotel are the railroad tracks (about 450 trains a day passing by here) and the Rhine. You can see the windows for our room, at the top left side of the building in the small rounded mini-tower with the rounded roof with the small ball above it. Things are very old here, but very beautiful! Below is a view of the side of our hotel facing the river and railroad tracks. The room at the top right side of the hotel is not our room, but the one opposite ours on the same end of the building. The castle way up on the hill in the background on the left is what we see out of that little mini-tower in our room. Our group had a meal together this evening, pork and dumplings and perch and potatoes. Dean had the perch, Janice the pork. Both were great. Our meal was followed by an ice cream and fruit dish with whipped cream and a wafer cookie. What a way to end our day. Tomorrow we go to Castle Rhinefels and then on our river cruise.